← A Regency Bicentennial: Prinny Takes All! In the twenty-first century, in the majority of countries across the globe, every city, town and hamlet has streets with names and all the buildings on each of those streets has a number. How else are all those postal carriers to deliver the many letters and parcels which we all send to one another? How will we find our friend’s new house, or that little boutique our sister has been raving about? Though we take it for granted today, the concept of house-numbering was just coming into its own during the Regency. Therefore, there was often no apparent rhyme or reason for why the buildings along a particular street or in a given neighborhood were numbered. And numbering practices varied from country to county. Even with house numbers, it was not always easy to find the place one was seeking, in England or on the Continent. First, to clarify, the word "house" in the term "house numbering" is used in the sense of a building or structure, and is not limited to a dwelling or residence. The "houses" to be numbered could range from town-houses to ware-houses, as well as anything in between. In the early days of house numbering, only actual structures were numbered, unlike today, when even vacant lots in new developments are automatically assigned a number. The first known instance of the numbering of houses occurred in Paris, in the early sixteenth century, on a bridge similar to the medieval London Bridge. By the time of its completion in 1513, the ornate Pont Notre-Dame had sixty-eight houses, in this case, residences, running along its length. All built at the same time, the facades were all identical, each with three stories and a gabled attic. Though it made a grand vista, the very uniformity of the facades was a problem, as there was no way to distinguish one house from another. The municipal authority which owned the properties decided to number them, as a simple method by which to keep track of their holdings. The numbering was not implemented to enable messengers or others to locate a particular resident. The numbering scheme of the Pont Notre-Dame was not to be repeated again for nearly two centuries. Throughout the sixteenth and seventeenth centuries, in London, as in most cities across Europe, not only did no buildings have numbers, there were many streets which did not even have names. And there were many instances of multiple streets with the same name. In the dense rabbit warren that was late medieval London, the majority of streets were quite short, created in the helter-skelter, unplanned development of most early cities. There was also no zoning, as we know it today, so residential and commercial buildings went up cheek-by-jowl with one another. But in those days, having a residence near a commercial property was an advantage. Commercial premises typically had a unique sign of some sort by which they made themselves known to customers. These signs also served as landmarks by which a person could give directions to their residence. For example, one could explain that their home could be found three doors along from the shop with the sign of the blue goat or just around the corner from sign of the copper kettle. It was not until the eighteenth century that the idea of numbering houses resurfaced. In London, records show that the first instance of house numbering occurred in 1708, along Prescot Street, a new development at the time, in Goodman’s Fields. This was to be the pattern in London for the next six decades. Typically, new developments would be numbered, but this was done at the discretion of the developer, there were no laws mandating house-numbering at this time. In most cases, such numbering was done for the same reason the houses on the Pont Notre-Dame were numbered centuries earlier. By the eighteenth century, in the majority of the property developments, the buildings erected were uniform in both design and materials. Thus, they all looked alike. The easiest way to identify each structure was to assign it a unique number. Such had not been the case in the preceding centuries, when there were few organized developments. Rather, someone would acquire a plot of land in the city and hire a house-builder or carpenter to build their home or shop, or even build it themselves. Each structure was therefore unique, so the name of the general area of the city and a description of the house, along with mention of a nearby building with a unique sign, would be enough to direct someone to their premises, even if the street on which the building was located did not have a name. Eventually, the numbering of houses in England was mandated by law. Parliament included a requirement that houses be numbered in the Postage Act of 1765. However, people did not rush out and number their houses right away. It actually took two years to implement the law in London, so house numbering in the metropolis was introduced in 1767, though it took several years to complete. New developments were the required to be numbered when they were built, while older areas were slowly renumbered over time. The spread of the numbering of houses was eventually implemented throughout the country, coming most slowly to rural areas. Many country houses, large or small, were not numbered by the Regency, some remain un-numbered to this day. However, it had been a long-standing practice to name houses in the country. Therefore, the lack of house numbers was seldom an impediment for those who carried the mail or delivered messages in rural areas. Since these messengers and mail carriers were most often locals, they had no problem knowing were to deliver letters and packages, if the name of the house was included in the address, and often, even if it was not. But it must be noted that the numbering of houses could still cause much confusion, as there were various number schemes which might be implemented. On the Continent, it was usual to have odd numbers on one side of the street and even numbers on the other, ascending in order from one end of the street to the other. The English, of course, did not hold with those "foreign ways," so they tended to use a different numbering scheme. From the eighteenth century, until well past the Regency, it was most common in England, particularly in London, to number streets sequentially, up one side and down the other. Both Pall Mall and Downing Street are numbered sequentially. This numbering scheme could present problems when a street was lengthened, or renamed as an extension of another street which had already been numbered. Sometimes these altered streets were re-numbered, but more often they were not. In almost all cases, houses situated around a square were also numbered sequentially, the numbers rising in a clockwise direction around the square. Those streets which were developed on one side only were also usually numbered sequentially along their length, with the numbers rising as they moved out from the city center. However, there were developments here and there in London, and in other large English cities, where the Continental numbering scheme of odd and even numbers on opposite sides of the street were used. The original 1765 law regarding house numbering was very vague, so there were no hard and fast rules for numbering schemes. The owner of each street could name the street and number the houses along it with any scheme they liked. The lack of regulation for house numbering resulted in many idiosyncratic numbering systems. In some cases, one street might even have multiple sets of numbers. As an example, about 1780, Craven Street, off the Strand, had three sets of numbers for a time. This was often the result when two, short, previously numbered streets were combined into one longer street. Until well into the nineteenth century, it was common to number only built structures. Thus, any buildings put up later often had to be given intermediate numbers, which could have been a letter suffix, such as 221B, or half numbers, such as 44 1/2. In a few instances, a house added later at the low-numbered end of a street was numbered 0. There was also the problem that many property developers were superstitious, and chose not to use the number 13. This could be resolved either by skipping the number entirely, or by using a sequence such as 12, 12 1/2, 14, &c. If two or more houses were combined, one of the previous numbers would be assigned to both, or their numbers might be combined, such as 7/8 or the address given as a range, such as 10 – 12. There were times when the numbering of the houses along a street were so tangled that the whole street had to be renumbered. There were cases when the street’s residents welcomed the correction, but in other cases, they fought against it. These disputes were usually resolved by the current property owner. Occasionally, a municipal authority might become involved. By the end of the eighteenth century, most streets in the larger cities of England had both names and numbers. However, to add to the confusion of the various numbering schemes, streets were also named by the people who developed them, not by the municipal authority. This meant there could be more than one street with the same name, in the same city. The street names of new developments might reflect the names of the developers themselves, such as Bond Street, or their titles, such as Portland Place. But developers might also choose to name their streets after popular figures or events. For example, after June of 1815, there were any number of developments across England, and several in London, which included streets named for Wellington or Waterloo. To add rather more piquancy to the confusion of street names, even during the Regency, not all of these streets had signs which provided their names, as that was also not yet required by law. And, even if Regency streets were numbered, there was no law requiring that those numbers actually be displayed on the house. Signs bearing the name of the street were the responsibility of the developer, but the display of house numbers was the responsibility of the individual house-holder. Not all of them made the effort. Then, in 1817, a law was passed which made the numbering of houses in London the responsibility of the municipal paving authorities, along with minor side-walk (pavement) repair and street cleaning. By the end of the Regency, nearly every street in London had a name, and each house along those streets had a number prominently displayed. These practices would be gradually implemented in the larger cities and towns of Britain during the reign of George IV. But they would not reach the more remote rural areas until well into the reign of his niece, Victoria. The uniform posting of both street names and house numbers in London did not happen until a full twenty years after Victoria came to the throne. The passage of the Metropolitan Management Act gave the power to control and regulate the naming and numbering of streets and houses to the newly instituted Board of Works. However, it was not until 1857, when the Post Office put intense pressure on the Board of Works, that they began to resolve the various problems with addresses. This resulted in the renaming and/or the renumbering of a great many streets, beginning with a list of the most confusing streets which the Post Office had compiled and provided to the Board of Works. By the later decades of the eighteenth century, the naming and numbering of streets, particularly in London, put an added burden on many servants. They now had to be literate, at the very least they had to be able to read, in order to deliver messages for their masters. In previous centuries, when a house was found by knowing the general vicinity in which it was located, along with a description of the building and its proximity to some typically pictorial sign, the need to read was not required to deliver a message. But when there began to be long streets of buildings which all looked alike, usually with no pictorial signs anywhere in sight, a messenger must be able to identify his destination by the house number, assuming, of course, it was displayed. The primary burden of literacy fell on footmen, who were most often charged with the delivery of messages in large households. But coachmen, valets and ladies’ maids might all also be expected to deliver a missive from time to time, so most employers sought servants who were literate for these positions. Though the inability to read might prevent someone from getting a job as a servant, the ability to read often meant they could command a higher salary than those who could not. Street naming and house numbering was a boon to tourists in Britain, as well as its citizens. By the mid-eighteenth century, the larger cities and towns were beginning to publish local directories, as listings became less complicated. Providing the location for each resident or business was simply a matter of noting their street name and their house number, if they had one. As the century drew to a close, most businesses made it a point to have a house number, as it ensured potential customers could easily locate their shops and other premises. The last few decades of the eighteenth century also saw the development and publication of guidebooks for large British cities and major resort areas. Street names and house numbers made it much simpler to provide precise locations of the various points of interest listed in the guidebooks. The guidebook concept would eventually spread to the Continent, as more and more cities adopted both house numbering and street naming. Paris, for example, instituted the numbering system it still uses today, in 1805, under the rule of Napoleon Bonaparte. The writing and/or printing of addresses in the late eighteenth and early nineteenth centuries did not follow the same format that we use today, though it was similar. Street names were always written with a hyphen between the name of the street or other designation. For example, Drury Lane would have been written, or printed, as "Drury-lane." When house numbering was introduced, the number of the house was placed before the street name, but was always separated by a comma. Thus, during the Regency, the address to Gentleman Jackson’s boxing salon would have been written as "13, Old Bond-street." The lack of precision or regulation in the naming of streets and numbering of houses offers any number of opportunities for messages to be mis-delivered or to otherwise go astray in a Regency romance novel. Perhaps the intended recipient of a missive might live on one of those streets which shared the same name as one or more other streets. A footman or maid new to the metropolis might not realize there were two George-streets and took a secret love note to the house with the right number, but on the wrong street. How might that unintended recipient respond to that communication? Or, perhaps an orphaned young lady and her siblings come to the city to seek their reclusive guardian, but cannot locate him because he has never put the number on his house? Mayhap a French spy comes to London on some nefarious mission but is confused by the house numbering scheme and is delayed in meeting his English contact. Dear Regency Authors, how might you employ the mish-mash of street naming and numbering in Regency London to advance your story? 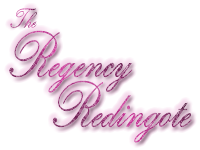 This entry was posted in Places and tagged Books, Regency, Travel. Bookmark the permalink. I have a question: only rich people named their homes or did everyone in general? I am glad you found the article of interest. Naming houses was not the sole province of rich people. Many middle-class people also named their homes. Even some not especially prosperous folks named their homes, or inherited homes with names and continued with the use of those names. I have friends in England today who are quite middle class and live in a smallish town on the outskirts of London. They have named their home, as have a few of their neighbors. Some of them have had very attractive plaques made with the names of their homes which they hang on the house or on a post near the walkway to their front doors. You could name your home, too, if you like. Though, of course, today, you will still need your street address to ensure you get your snail mail. Really interesting piece; thank you. I was wondering if you have more detail on that 1765 reference, as I’ve looked at that 1765 act in question and can’t see the requirement in it (see http://www.markpack.org.uk/38336/house-numbering-in-the-uk-the-mystery-of-postage-act-of-1765/ ). What is it I’m missing? It would appear you have already answered your question in your own article. Thanks for taking the time to reply to a comment on a post from a while back Kat. I was wondering if I’d missed some other more definite connection that explains why the Act is so often cited. Perhaps one day I’ll find one! Then please provide your sources.